Raymarine C120W, another unbiased independent review. The Raymarine C120W is the midsized unit in the newly released C-series widescreen network capable multi-function chartplotter lineup. The C120W ships with the display unit, a sun cover, documentation, and cabling. The display has an internal GPS sensor and can connect to an optional external GPS antenna if desired. It also comes with preloaded cartography covering U.S. coastal waters. The C120W can also use Navionics Gold or Platinum cards in its single front panel card slot. When so equipped the unit will show 3D navigation and high-resolution photo coverage of certain areas. The display unit is quite large, it measures 15-inches wide, 10-inches high, and about 4.5-inches deep. Our test unit was loaded with software version 1.12. We mounted the Raymarine C120W to our test rig using an optional metal trunion bracket. Normally a display this big would be flush mounted in a panel. Hardware to flush mount is supplied. The power supply, which can be either 12- or 24-volts DC, NMEA0183 data, and a video port all pass through a single cable that attaches to the case back with a twist lock connector. The case back also has two SeaTalkhs network ports that allow the C120W to connect to another C-series widescreen display, radar, AIS, or a black box sounder. The case back has a fourth cable connection for SeaTalkng, an N2K compliant network. The C120W has a three of NMEA0183 ports built-in. Port one is a normal NEMA0183 input/output port. Port two is also input/output capable and high-speed, meaning it can operate at 38,400 bauda necessity today for anyone looking to connect a high-speed device like AIS to this unit. Port three is normal speed input only. We didn’t get to test this funtion but Raymarine Marketing Manager, Jim McGowan, gave us the briefing. Here it is. The Raymarine C120W and other C-Series Widescreen systems now feature SeaTalk autopilot integration as a standard feature. This makes it much more convenient to use your Raymarine autopilot navigation mode. In the past, to make the autopilot track to a route or waypoint on the chartplotter, it was necessary to first activate the destination on the chartplotter, then activate the navigation mode on the autopilot, then confirm the destination on the autopilot too. This required several button presses on each device, and depending on the proximity for your chartplotter to your autopilot control head, may require several trips across the boat or up and down a ladder. With the latest software in your Raymarine Multifunction Display, the MFD is now totally autopilot aware. We have even added an autopilot status icon to the MFD’s data bar to support this. Now, whenever you use the Goto Waypoint, or select the option to follow a route, the chartplotter displays a prompt asking if you would like it to activate the autopilot and track to the destination. All of the button presses required to make this happen can be done right there at the chartplotter. If you have multiple MFD’s networked together, this feature is available on all of them. 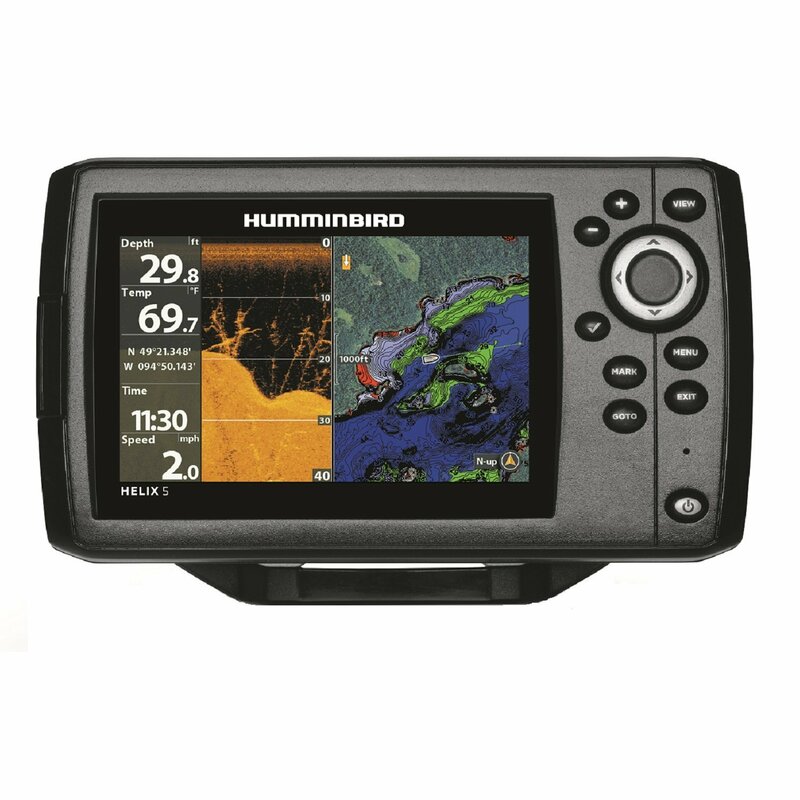 The Raymarine C120W display screen uses a landscape layout and measures 10.2-inches wide and 6.5-inches high, on the diagonal it is 12-inches. Resolution is a very high 1280 by 800 pixels. Actually that is the highest resolution screen of any display weve tested to date. During our daylight viewing look-see we found the screen to be bright and easy to read even in the strong afternoon South Florida sun. The screen remains viewable even at steep side angles. When we put on our polarized sunglasses the screen darkened somewhat but was still quite viewable even at from the side. We gave the C120W an excellent rating for daylight viewability. Because of its high resolution this screen shows amazing detail when viewed close up, while still having the ability to show data in large numbers and letters that can be read from far away. Even with my middle age eyes I could read the data page from about six feet away in low light conditions. The Raymarine C120W has two screen color palettes for viewing the chart page, day and night. They are selectable using a soft key. A slider lets you adjust the brightness of either as needed. The Night mode dims the screen significantly. We rated the C120W excellent for night viewability. At night, when viewed from side angles the screen remains clearly readable. The Raymarine C120W has five soft keys, six function pushbuttons, and a rotary trackpad with an OK button in the middle. Soft key functions change to enhance the usefulness of the displayed page. The unit can show full screen views of the chart page, course deviation indicator with data, and user selectable data in large numbers and letters. If so equipped, it will also show full screen radar, fishfinder, video, and 3D chart data. The C120W can also display combination views in two, three, or four windows. Pressing the Active pushbutton toggles between open windows making each active and bringing the associated soft key functions onscreen. We found the unit very intuitive and easy to operate. One thing we really like on the C120W is the restart XTE soft key function. When you are traveling to a waypoint and need to maneuver off-course for some reason and then want to navigate back to the same waypoint without getting back on your original course track all you have to do is hit the restart XTE soft key and the unit will reset the cross track error to zero and recalculate the course to the waypoint. When I am traveling or fishing I find this function a necessity. Route building with the C120W is a snap; just follow the soft key prompts. The cursor pad can be used to place waypoints directly onto the chart page wherever you desire. More soft keys options let you save the route, edit it, follow it, and reverse course on it. We found it to be a very intuitive and easy to use function. The Raymarine C120W can display up to four data sources in their own individual window. The Active button switches control between windows. The large data bar is on top. Pressing and holding the WTPS/MOB function key puts the unit in man overboard mode. An audible alarm will sound and if you are on a chart page the view will automatically zoom into the MOB position, draw a course line back to the MOB, and change the data box display to that needed for a quick return. If you are not on a chart page navigation data back to the MOB will only be displayed in the data boxes. A second press of the MOB key takes the unit out the MOB mode. Data boxes can be placed on the top or side of the screen. The normal data box display mode shows you minimal information. We prefer the large mode, which shows cursor position, course/distance to waypoint, vessel position, COG and SOG. Each data point can be changed by the user. Screen redraws on the C120W are fairly fast, even when ranging in or out several levels at once. We tried Heading Up, North Up, and Course Up chart orientation on the Raymarine C120W and found all worked well. The unit responded quickly even when making large turns at slow speed. The Raymarine C120W has a large bright screen, intuitive software, and is capable of interfaces with a wide variety of other components. This makes it a system you can install and build to your needs. It carries has a 2-year warranty and is waterproof to IPX6 standards.